SINGAPORE - The tight labour market has driven up wages and employment for locals, as employment growth for foreign workers falls to its slowest pace since 2009. Local employment grew by 41,000 in the first six months of the year (2014), up from 34,100 a year before. 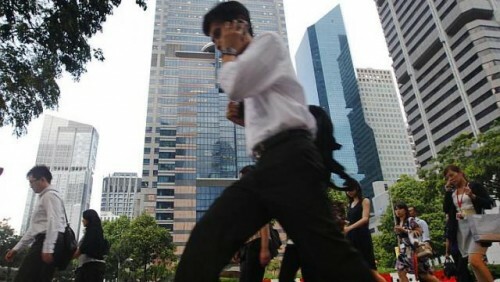 Real median income for fully-employed Singaporeans grew by 4.6 per cent last year. And the trend of hiring of locals is expected to continue, the Ministry of Manpower (MOM) in its half-yearly labour market report Monday. "[This is the result of] a confluence of foreign workforce constraints, higher wages and employers' adoption of flexible work arrangements to attract more women and older workers," said the ministry. In contrast, foreign employment growth slowed. Excluding maids, foreign employment growth slowed to 3,800 in the three months to June. The last time foreign employment grew this slow as back in the third quarter of 2009, during the recession. Foreign employment expanded by just 700 during the three months then.